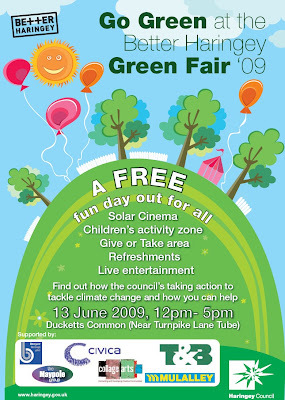 Planning is underway for the Better Haringey Green Fair 2009 which will take place on Saturday 13 June 2009 at Ducketts Common (opposite Turnpike Lane tube station). *Better Haringey Awards - The fair will host the awards for the very first time to reward great environmental practice in the borough. Nominate now with great prizes to be won. For more information visit the Better Haringey Awards page. *Live on stage entertainment - Powered by a pollution free PA system. *Solar cinema - Including the first Haringey showing of 'The Age of Stupid'. *Basketball Tournament - An opportunity for all ages and levels to get involved and play basketball, and learn a little about staying healthy. *A range of environmentally themed information stalls - Ever wanted to know how to grow your own salad, or what happens to your recycling? Maybe you are keen to reduce your energy bills or want to learn how you can help implement the Greenest Borough Strategy? You can find that all here. *Give or take area - If you have any clutter that you think someone else can put to good use bring it along. You may also find exactly what you've been looking for. *Refreshments - A range of delicious refreshments will be available on the day for you to try. Children's activity zone - Children can enjoy a range of activities including workshops and games.